"Crocheted baby booties pattern below"
You can find patterns for crochet booties from basic and simple crochet patterns to the fancy and very detailed sneaker design. There are Mary Janes, cowboy boots, high tops and ballerina type slippers. Crocheting booties onto these cute little cowboy boots will be the talk of all your friends. Below you will find the pattern for cowboy crochet booties. 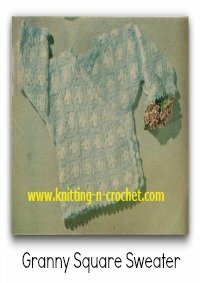 When you began your search you will find many download crochet patterns for free. 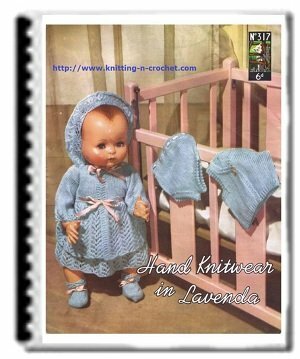 Lion Brand, Coats and Clark and Bevs Cottage are just a few places you can find some very interesting patterns for babies from preemie size to 9 months old. 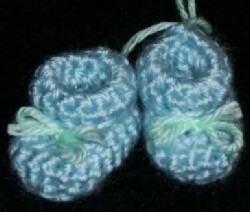 A cute little gift wrapping idea is to make up a pair of crochet booties in the color of choice. Than tie them together with a little ribbon and attach them to the baby shower gift. I promise this will make your gift stand out at the party. 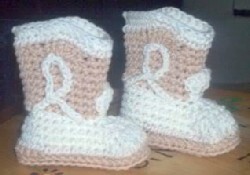 A nice baby set can consist of crochet booties, hat and sweater. And if you want to make it perfect add a nice crocheted blanket to the set. Every new mother will appreciate such a thoughtful gift. Sizes: Directions are given for small size with changes for large size in ( ). Small size: Use small directions and F hook for 3 1/2" finished sole. Medium side: Use small directions and G hook for 4 1/2" finished sole. Large size: Use large directions and G hook for 5" finished sole. CC Edge Rnd 1: With CC yarn, join with a sc in center back, sc in each st around with 2 sc in 2nd dc of each 4 dc group of last rnd. Row 1: Going back to the front loops of rnd 11 and working in the 3 center front loops, with gold yarn, sc in each of 3 center loops, ch 1, turn. Row 2-3: Sc in 3 sc, ch 1, turn. Row 4: (sc, hdc) in first sc, 3 dc in next, (hdc, sc) in last sc. Fasten off. Tack top of emblem to boot. With single strand of CC, ch 25 (30). Arrange in design (look at picture) and tack in place.